For nearly three quarters of a century Jeppson's Malort, Chicago's native wormwood-based spirit, has been both reviled and celebrated for its powerful, sustained bitterness. Malort—the name is Swedish for wormwood—descends from a family of bitter schnapps said to be good for digestion. But in the late 30s, after Chicago attorney George Brode purchased the formula from Swedish immigrant Carl Jeppson (essentially the dried botanical macerated in grain-neutral alcohol), he began marketing it on the basis of its aggressive unpalatability. It's never been available outside of northern Illinois. But here it persists in many watering holes as a tool of cruel pranksters or a test of one's appetite for punishment. "After that it became trying to think of the nastiest thing we could," says Dan. "And then we took all these regular drink recipes and started subbing out the main ingredient for Malort and giving it a funny name." Brixie's now has a list of nearly 20 Malort shots and cocktails, a handful of which—including the Malort-and-milk combo they call Malilk—no human has ever dared ingest. The brothers are genuine fans of Malort's flavor, but also of its power to offend. They've cooked bratwurst in Malort and dyed it green on Saint Patrick's Day, and Tim—who describes its taste as "baby tears and gasoline"—says he fantasizes about building a career as a Malort marketing rep. "We're right at the point here that something that is so disgusting that it's funny can really take off," he says. I like his gumption, but I've tasted Brixie's Biledriver (Malort and OJ), the Malortarita (with triple sec and lime juice), and the Scandalous Scandinavian (with soda and a superfluous dash of Angostura bitters). With all due respect, I don't think he should give up his day job. But I wondered if some of my favorite bartenders—employing fresh juices, fine spirits, and the trained mixologist's keen sense of balance and proportion—could come up with cocktails that would actually redeem Malort from its unsavory reputation. So back in February, I put it to them. These days Malort is distilled in Florida, but the Jeppson company's current owner, Pat Gabelick, still runs the company out of Chicago. Gabelick, 65, worked as George Brode's secretary until he died in 1999—and by her own admission hates the taste of Malort. So I invited her along to taste the cocktails concocted by some of the five other bartenders I'd lined up and see if they could change her mind. Paul McGee of the Whistler is a relative newcomer to the midwest, having previously worked for Wolfang Puck in Las Vegas. He was unfamiliar with Malort until a couple regulars prevailed on him to make a cocktail with it. "The only thing I could think of was a negroni variation using Malort instead of Campari," McGee told me. "They both loved it, and subsequently named it the Golden Eel after a Ween song by the same name. They thought the drink was good but kinda messed up, and so is Ween." After that, McGee thought Malort might work better in a "refreshing" drink, so he created one based on the Mexican tequila-and-grapefruit potion known as the Paloma, combining a peppery Herradura Silver with half an ounce of Malort and orange and lime juice, topped off with spicy ginger beer and garnished with crystallized ginger. I could see it taking off in Little Village. And in fact Gabelick noted that in recent times Malort's popularity in Swedish and eastern European bars has been outstripped by its growth in Mexican ones—Brode used to advertise in La Raza, she said. Violet Hour bartender Stephen Cole mixed two cocktails, one of his own invention and another submitted by his boss Toby Maloney. Cole's Michigan Cutter combined an ounce of Malort with another of Amaro Montenegro, a bittersweet Italian digestif, along with lemon juice, simple syrup, a dash of orange bitters, and egg white for body, topped off with 7Up. The amaro rounded off the Malort and mitigated its shock, making the bitter finish enjoyable. Gabelick, who still rolls her eyes at the macho marketing techniques Brode established, appreciated the egg white. "As a woman, it makes it a little more fun to drink," she said. "Something that's frothy like that." This could be a first—a girly Malort drink. Maloney dubbed his cocktail the Ukrainian Negroni, in honor of the Division Street dives where he downed his first shots of Malort. He was the only bartender to build on an already bitter recipe. While he used a scant quarter ounce of Malort, his was the booziest and perhaps most challenging—and yet most balanced—cocktail we tasted, incorporating two ounces of gin, an ounce and a half of Carpano Antica sweet vermouth, a quarter ounce of bitter Campari, and the ignited essential oils of an orange peel dramatically squeezed over the top. Brad Bolt of Bar DeVille also came up with a bracing bit of alchemy, the Hard Sell—equal parts Malort, Beefeater Gin, St-Germain elderflower liqueur, and fresh-squeezed lemon juice, with a grapefruit peel twist. The garnish was a particularly appropriate stroke; its sharp, citrusy top note was a complementary hint of the slowly developing bitterness to come. This was easily Gabelick's favorite. Peter Vestinos, formerly of Sepia, now works as development director for the Wirtz Beverage Group, one of only two distributors that handle Malort. He came up with the Three Worms—Malort, absinthe, and dry vermouth with simple syrup, lime and tangerine juice, egg white, and a tangerine-peel garnish. The "worms" of the name refer to wormwood, an ingredient in absinthe and at one time also in vermouth, which takes its name from the Middle High German name for the herb. Like the Bukowksi, it incorporated an audacious full ounce and a half of Malort. "I think a mistake a lot of people make when they have a spirit that's challenging is to just bury it," Vestinos says. "Malort you can't really hide. You gotta play with it." Pleasant flavors and aromas up front in the Three Worms softened the Malort's brutal attack, allowing its bitterness to develop slowly and linger at a manageable level. Brode's Malort bottle hangers once boasted that "only 1 out of 49 men (rarely women) continue drinking Jeppson Malort after the first 'shock-glass,'" but I think all these cocktails have the potential to even the odds. 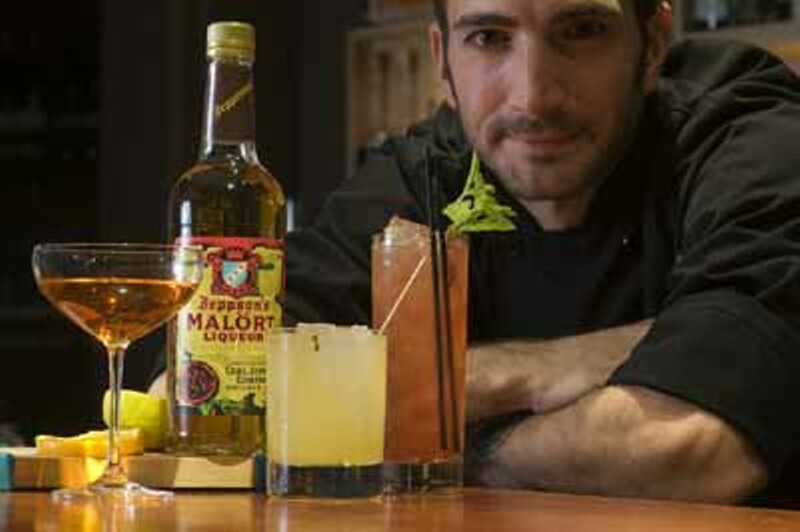 Joly, who has a few more Malort recipes up his sleeve, says he already mixes enough Bukowskis at the Drawing Room that he's considering adding a Malort cocktail flight to his menu. But Gabelick, who sells only between 1,000 to 1,200 cases a year, is dubious. "I'm hopeful," she says. "But I'm a glass-half-empty kind of person." A short video made for a Second City competition imagines where the wormwood-based spirit might originate. Brad Bolt's Malort cocktail is a finalist in the St-Germain Can-Can Classic. If you want to make your own Malort, all you need is booze and wormwood. Video: Bar DeVille bartender Brad Bolt's delicious Malort-based cocktail the Hard Sell.